Just like World War I got a sequel, Battlefield 1is getting a followup later this year. The game is Battlefield V. It was previously known as Battlefield 2 internally at EA. Battlefield V will return the series to World War II in a main entry for the first time since 2009’s Battlefield 1943, GamesBeat has learned from sources familiar with EA’s plans. These sources wish to remain anonymous. Above: A leaked logo for Battlefield V.
I reached out to EA to offer a chance to comment. I’ll update this story if it provides a statement. Battlefield I is a huge success for EA. It sold faster than Battlefield 4, and it has surpassed 25 million players as of December. Fans were excited to return to a historical setting after years of modern military shooters from both Battlefield and competitors such as Call of Duty. Publisher Activision also showed that the appetite for the second World War is still high with its release of Call of Duty: WWII last year. That is the best-selling Call of Duty since the franchise peaked with Black Ops II in 2012. This is an entirely new Battlefield game and not a remaster of the 2005 Battlefield 2. EA will reveal it soon, and it will launch it before the end of this calendar year. EA and Battlefield developer DICE decided on this strategy several years ago. They knew they wanted to get away from the modern and near-future settings for a while, but it also didn’t want to burn the WWII setting right away. This led the studio to start with WWI knowing that it could always still go to WWII with the next game if Battlefield 1 didn’t work out. Of course, that wasn’t the case — Battlefield I finished 2016 as the No. 2 best-selling game in the United States, according to the industry-tracking firm The NPD Group. While EA is going with World War II, some fans may remember a recent rumor from December that DICE is working on Battlefield: Bad Company 3 that takes place around the Vietnam War. That rumor isn’t accurate. If EA is considering a sequel to its console-focused Bad Company spinoff series, it likely won’t happen soon. That said, DICE is listening to fans of Bad Company, and it is keeping a potential sequel in its back pocket in case it needs to make another strategic shift in the future. After all, I’m not sure a new Battlefield 3 set during World War III would make sense. 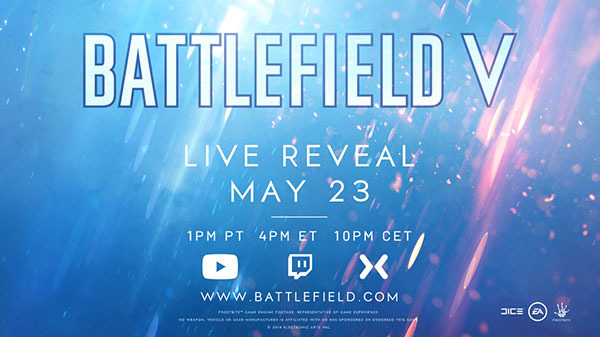 Updated at 10:49 a.m. Pacific time with new information about the name change from Battlefield 2 to Battlefield V: This story originally referred to the next Battlefield as “Battlefield 2.” That was the working title until EA and DICE changed it recently. If true and after the disappointment that was bf1...i will keep my expectations low. I thought BF1 was great. Graphics, gameplay, guns, vehicles, maps... they did an all around good job and made a really fun MP shooter in a WW1 setting. Looking forward to the next game no matter what they do. Boo hiss. Love Battlefield 1 and I'm still playing it. You can luv it and I can like it. It was just as good as BF3 and 4. Great series of games. Sure it will be good. Battlefield isn't my favorite but can't deny they're great shooters. Battlefield is going to keep its terrible campaigns but COD is going to cut its enjoyable ones. Sad. BF3 and 4 are terrible. Hated both of them. No! So please stop making up stuff. Been loving BF1 again. Didn't touch it for so long but I've put like 40 hours into it the past month after playing it for about 50 before that since launch. Really hope it is WW2 and while BF1's campaign was enjoyable it was pretty simple. Anyways, I really hope the battle royale rumor is bogus. Please keep this bulls*** away from Battlefield. During yesterday’s EA financial call, CEO Andrew Wilson spoke about the next entry in the Battlefield series, currently known as Battlefield 5, saying that will push the franchise forward in several ways. With our next Battlefield game, the team at DICE is bringing the intensity of combat to life in new and unexpected ways. Every battle is unique, and every mode brings its own challenges – from the way you interact with the environment around you, to compelling single-player stories, to the next level of large-scale multiplayer that spans across multiple maps and modes. Like Battlefield 1, Battlefield 5 will continue to be supported as an ongoing service. Everything considered the game will advance the state of the art for the franchise while still delivering a signature Battlefield experience. Battlefield 5 launches on a yet to be confirmed release date on yet to be confirmed formats, presumably PC, PlayStation 4 and Xbox One. We will keep you updated on the game as soon as more come in on it, so stay tuned for all the latest news. Just sounds like typical PR. ADVANCE THE STATE OF THE ART!!!! Nothing more artistic than a video game where you shoot people in the face over and over and over so that you can unlock a gun or attachment to help you shoot people in the face. Easily my most played franchise of the last and present gen. I still wouldn't exactly call it "art". Watching the reveal. So far it looks like SJW wins. I just saw trailer and really don't know how I feel. Speechless maybe? Disappointed? It's like a remake of the Dirty Dozen directed by Michael Bay. I don't understand the SJW comment. Because a female character is an option? I'd be more worried about her having the prosthetic hand and all the other over the top bs in the trailer. Yes. Unless she was Russian which she clearly wasn't. OSS maybe? But that was mostly spying. French resistance? I guess I'm a stickler for historical accuracy. I see none in that video.